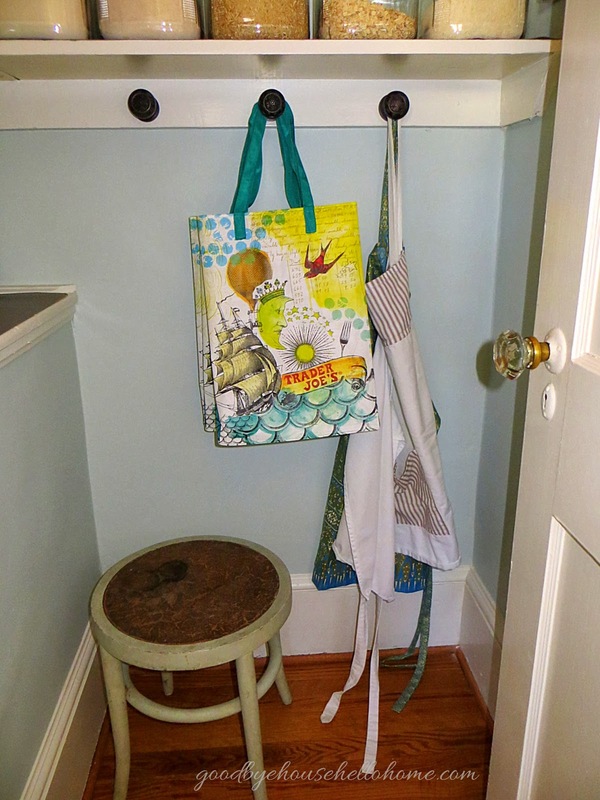 (and it's the smallest room: 4' by 4')! Welcome to our organized Craftsman pantry! 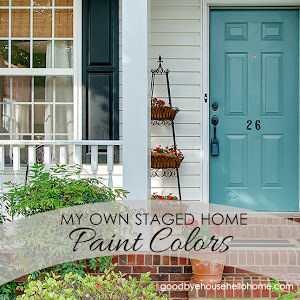 Do you remember the before pictures right after we moved in? This wood shelving unit got sold on Craigslist for $25. I had some items that were waiting to be used. 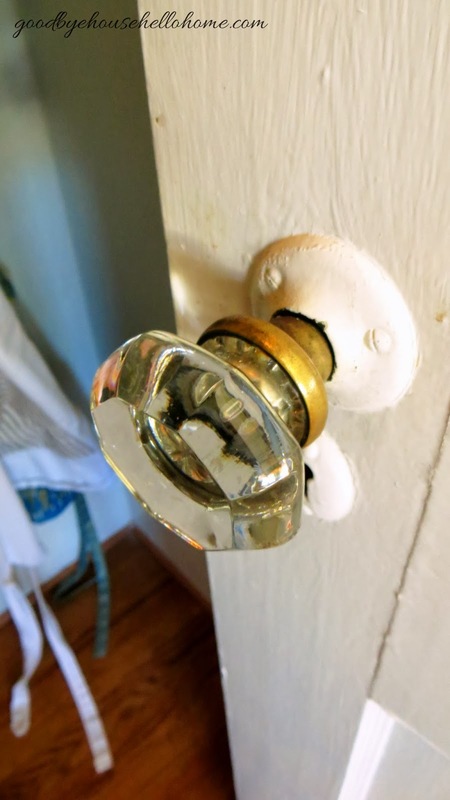 This 75 year-old home has settled here and there and some gaps needed to be filled. This color is called "Home Song" by Clark+Kensington. The trim is Alabaster by Sherwin Williams and will be used on all the trim/doors in our home. All this stuff waited to be returned to their new spots. Soon, I'll be showing you the zones that I've created in this kitchen. After a few days of work, here are the AFTERS. The top three baskets hold extra tissue, paper towels, and party goods. and I love her sense of humor when I told her to label the basket that holds chocolate. Top row tags read: SNACKS, mini~hospital, Pasta, MIXES (I make some of my own mixes). Bottom row tags read: DRIED fruit + nuts, cavities, Tea & Cocoa, VITAMINS. and most everything I make is from scratch. (the blender/food processor is next to the fridge on the counter since it's handy there to make smoothies). I also wanted space in front of the appliances to set things as I gather ingredients. and cloth-covered wiring. The former light was a bubble-looking piece. 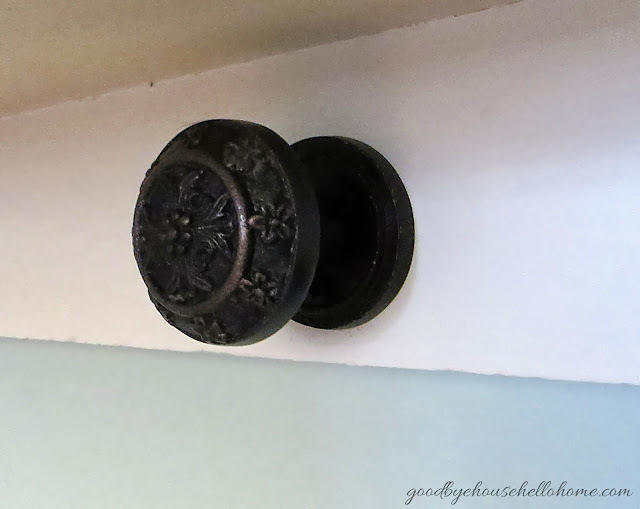 The ceiling is plaster, so hubby had to use a butterfly toggle bolt to hold the hanger. I found all these jars at Walmart. The small ones were $4, medium were $5, and the large were $6. AND one should know an ingredient by sight if they cook and bake as frequently as I do. I labeled them for you in Photoshop to give you an idea of what I keep in the jars. and then the knob gets threaded/tightened into the center of the base. of the drawer panel to tighten it. Because this space is so compact, everything needed to be easy to find and reach. The cork-topped stool I found at an estate sale and almost sold it before our move here. 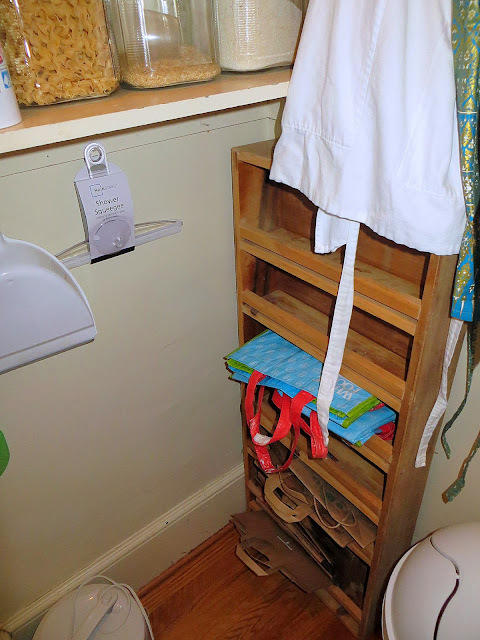 Since some of the shelving is so high (the walls are 10') we use it every day, so whew, glad I salvaged it! on the way out the door, and to return when they've been emptied. This room was quite fun to plan and design. 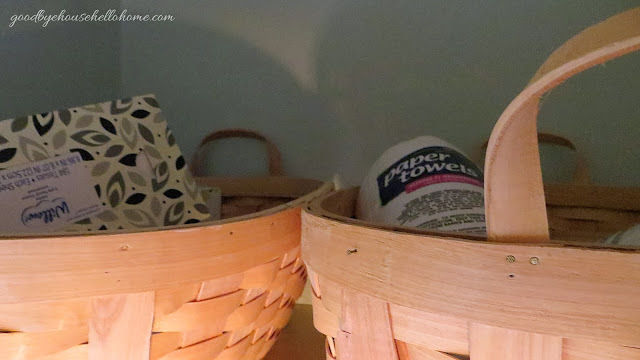 to help it stay fresh longer and look pretty (a basket is more simple than tiers of packages and jars). 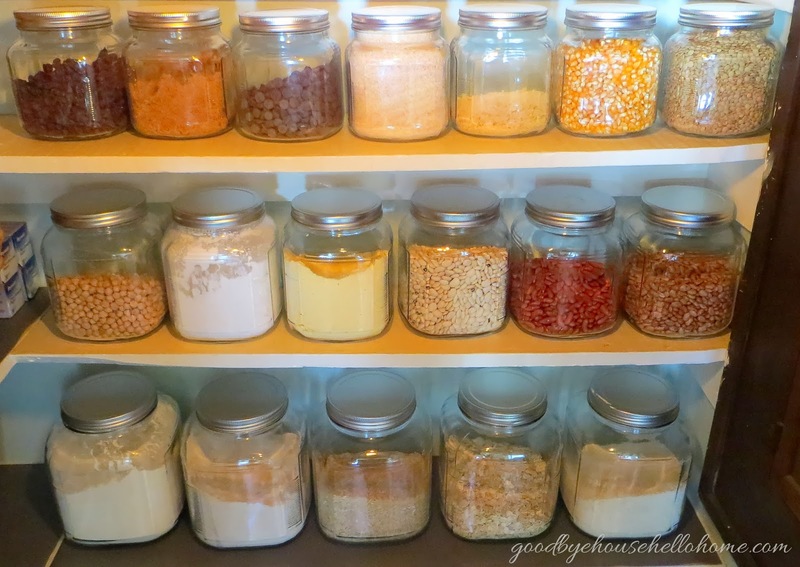 Hope I inspired you to go make yours a pretty pantry! Soon I will be sharing how to prepare your kitchen for the up-coming Holiday baking season! 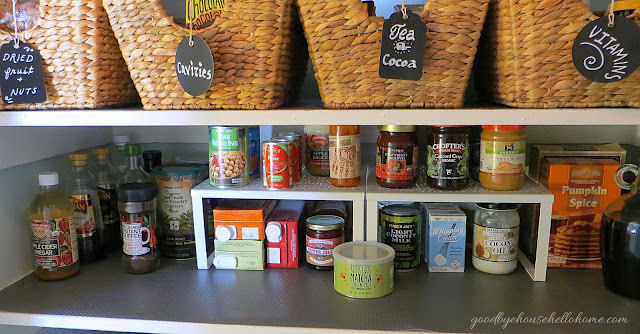 Leslie, Your pantry is lovely! Love your pantry. 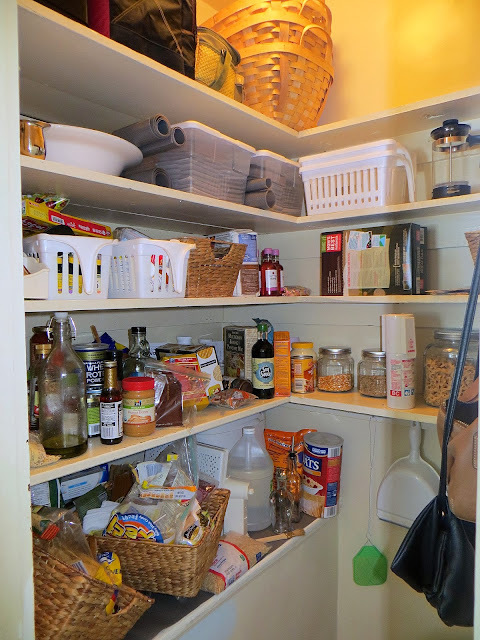 I don't have a walk in pantry...well, I don't have a pantry! 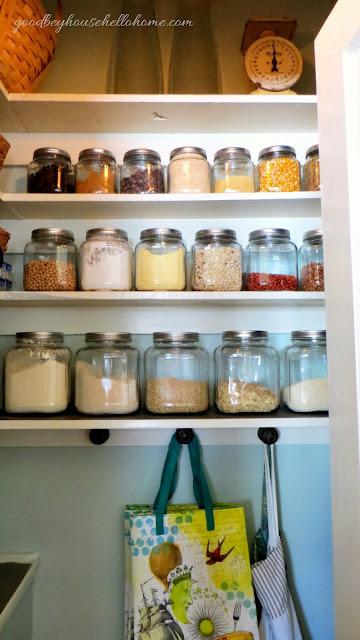 That is why I'm looking for just the right piece of furniture to create one in my 'Unfitted' kitchen...Love things in jars. I love your pantry! I wish I had a pantry so I could do something like this. 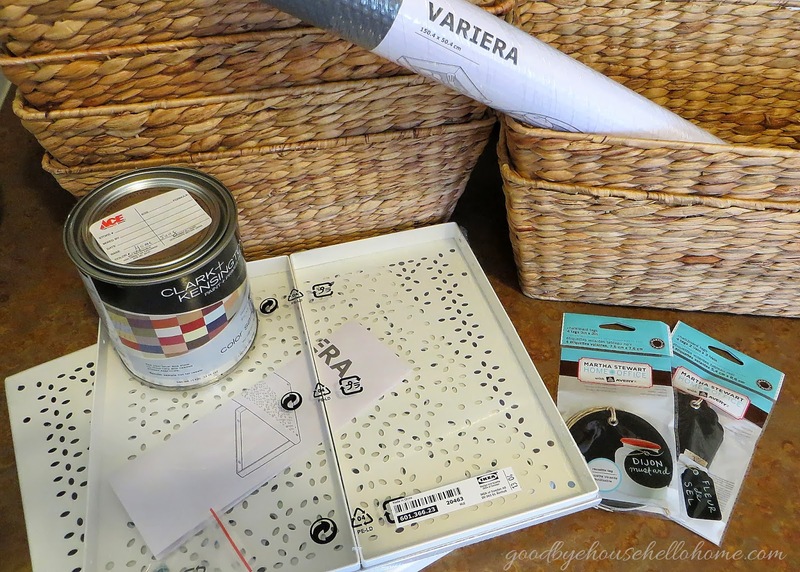 I love the ideas of the baskets on top. 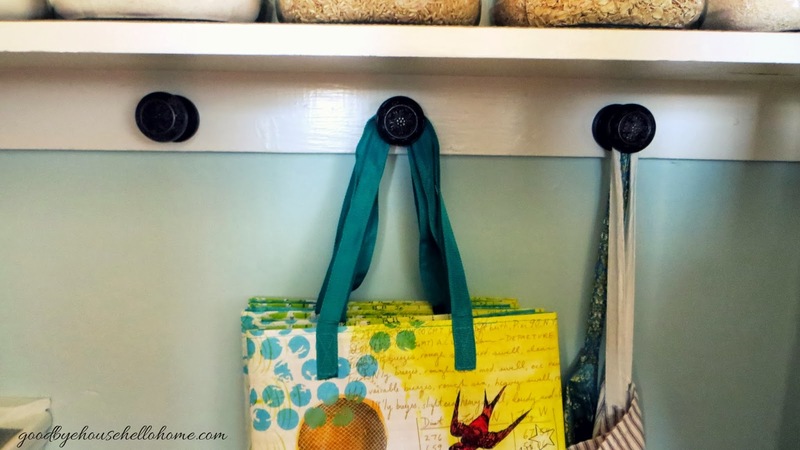 I will be using that idea in my cupboards that are really deep and I tend to lose things back there. Thanks for the great ideas. Leslie, this looks wonderful. I know you must love your sweet cottage. I love seeing what you are doing. 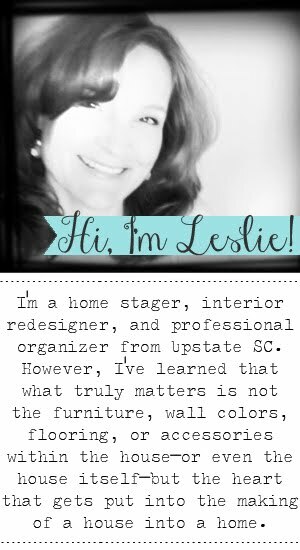 Oh Leslie my friend, you have done it again. 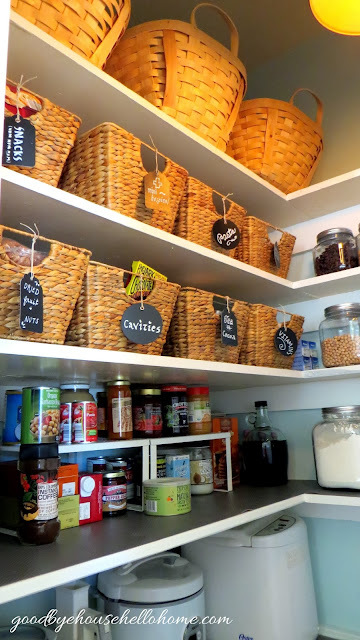 Such a wonderful job in organizing your pantry. 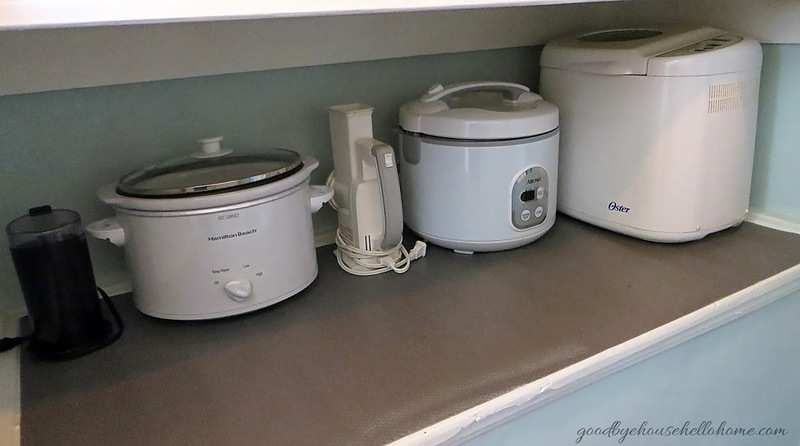 I spent a couple of hours a few weeks ago trying to get my small pantry straight - there is only room for food - no appliance storage - and it is coming along. I still need to do a little more work and you've given me some inspiration. 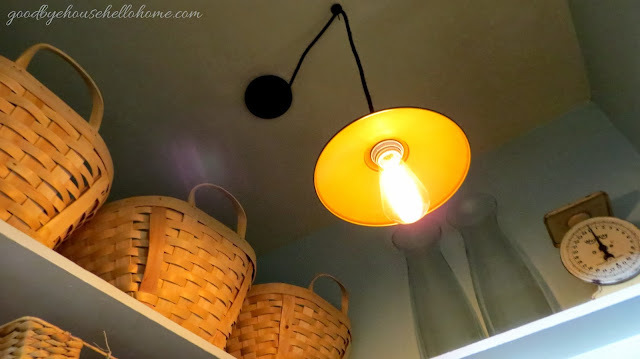 I have a few other projects going on (if you would like to check out all our projects on my blog http://cdm-arewethereyet.blogspot.com/ I would love to see what you think )- but finishing the pantry up is on the list! Thanks! Beautiful! 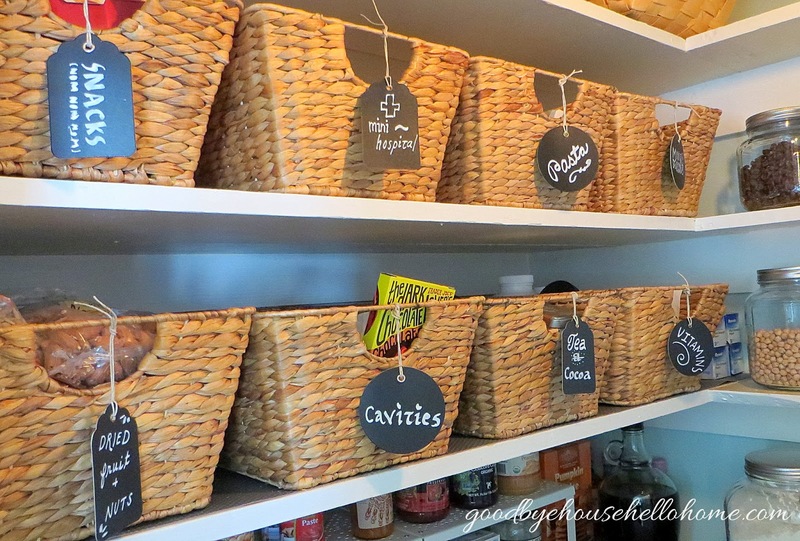 I love the colors you chose and how you used baskets and clear glass jars to organize! Dreamy! Stunning! I love the organization. It reminds me of a high end general or organic store. 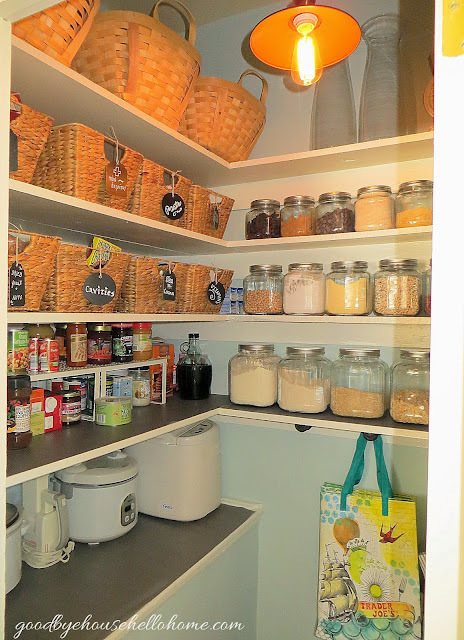 I redid my pantry a couple of years ago. It houses my garbage can, so it gets a lot of views from guests. It's now one of the most talked about features in my home. 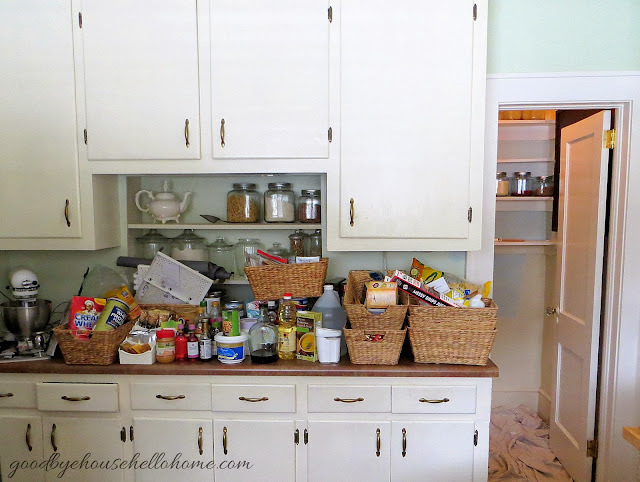 Who knew a pantry would get so much attention? 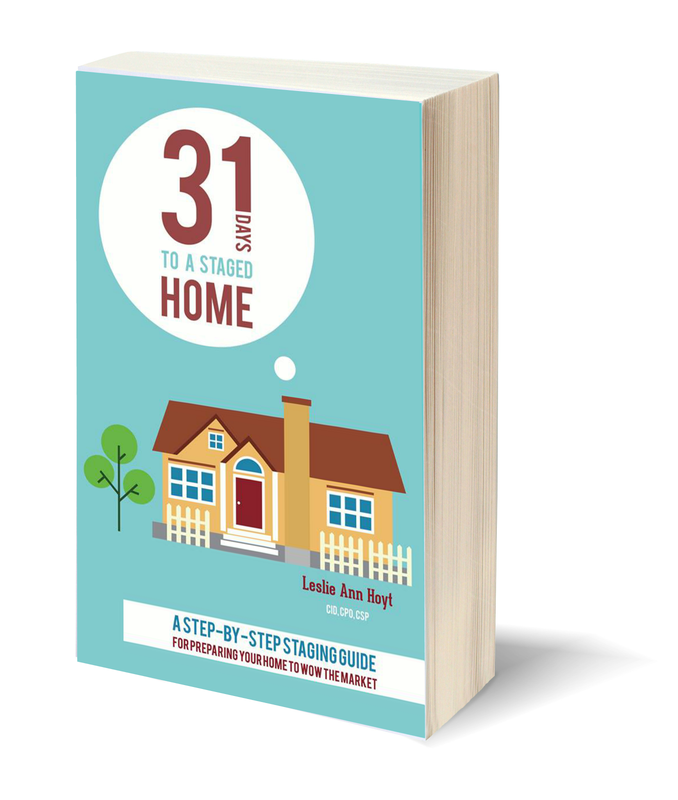 Well done in your recent project! Great job, I have just one hint for you. I'm an Idaho potato farm girl (well I grew up on a potato farm) don't keep your potatoes in the fridge it make them turn sweet. Good morning my friend! I must admit that I had pantry envy this weekend. It's beautiful! I even thought about taking a picture of it so that I could share it on my blog. You are amazing! Thanks again for your gracious hospitality this weekend! Big (((hugs))) to you! Wow! I love your pantry. What a great job! I'm slightly envious....it's so well organized and artistic as well. you did a great job with your deep cleaning and planning. 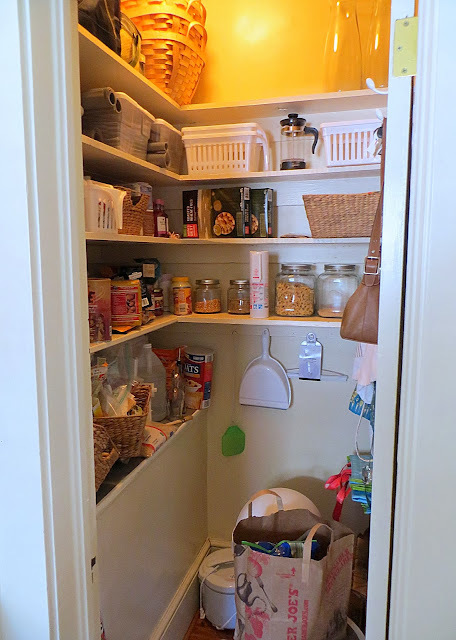 Your pantry is just wonderful! Such a great way to store what you need and use. Too cute on your daughter's labels!